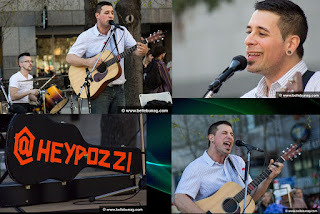 Jamsterdam Radio: Jersey Girl in Canada's Day at Art Fusion at Mel Lastman Square! Jersey Girl in Canada's Day at Art Fusion at Mel Lastman Square! The first time I attended Art Fusion was back in January at Daniels Spectrum in Toronto. There was so much to see at that fairly large indoor venue, as I mentioned in my blog about the event. 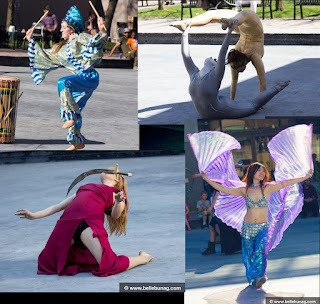 Various dancers at Art Fusion, May 2013. 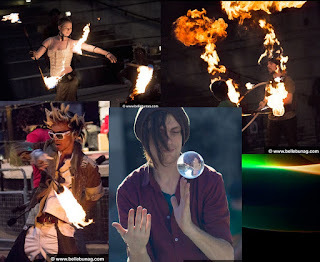 Fire spinners and guy with trippy floating ball. Right before that event in January, I had errands to run early in the morning, up until the time Art Fusion began, so I was loaded on matcha tea (basically the equivalent of drinking 10 coffees). This time was no different, since my sister, Belle is finally officially engaged, we had some engagement photos to take in High Park right before heading to North York. You may have seen her running around with her camera, as she was one of the event photographers! If you knew me from before, and I didn't get a chance to say hello, please excuse me, as I was too exhausted to even talk most of the time.. may have had one too many Redbulls that made me just crash mid-day. This time, Art Fusion's founder, Lisa Chessari, along with her great family and team of volunteers, seemed to have outdone herself, as she took the event outdoors to take up the entire Mel Lastman Square in North York! For those of you that have been to the previous Art Fusion event and this last one, you could compare how much more there was going on! This event on Star Wars Day was HUGE! I saw a lot of familiar faces, as well as a lot of new faces, including these two women painted silver and gold. At first, I totally thought the gold one was naked in the corner of my eye, so I kept looking at her. Either way, they both looked absolutely stunning! A couple of stilt-walkers skillfully roamed through the square, the fire spinners wowed the audience as always, there was a salsa dance class there- showcasing their talents, unicyclists galore, the percussionists were back in full force, jugglers, people doing caricatures, puppeteers, the ladies who dance with machetes, different music acts, etc. 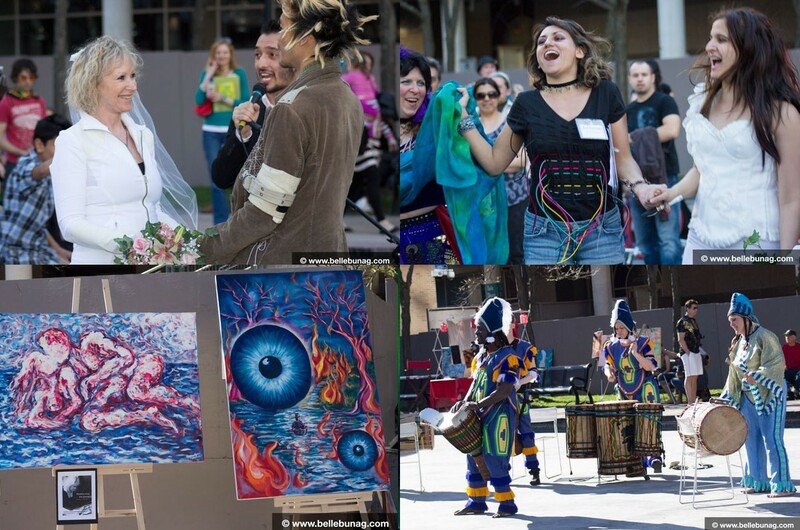 There was even a wedding ceremony where a few of the artists actually got married to Art Fusion- talk about literally marrying the arts! Perfect place and gorgeous day for such a beautiful event! Chris Pozzi feat. Matt Bellissimo, drummer from TROVE. This mentalist named John Roldan stopped me as I was walking to stage 1, told me what he does and that he usually does readings, but didn't want to pry, and asked me to think of a number... at first I thought "5", which is my favorite number, then I changed it to "57". First he asked me if it was a two digit number, I confirmed that. Then he was writing on the back of his business card, handed it to me, smiled and told me to take care.. I looked at the back of the card.. "57" was what he wrote... totally freaked me out, impressed and intrigued me! Honestly- it looks like Art Fusion is getting bigger and bigger every time! A lot more booths were set up on this gorgeous day to be outdoors, and more stages to go to watch some live bands play. I noticed passing through that there were quite a number of booths set up that believed in re-purposing and recycling, which I totally support, especially since Earth Day was not long ago, I do hope more people are encouraged to celebrate Earth Day every day of the year. In terms of bands at Art Fusion, I actually caught a couple of Jamsterdam Radio artists play live, such as J'Nai and Chris Pozzi, as well as a band called TROVE, who you'll be hearing a lot from in the near future. There was this one guy (I didn't catch his name, but if you know who I'm talking about, feel free to comment down below) that was playing a bunch of different instruments at the same time while singing solo. That was pretty awesome. 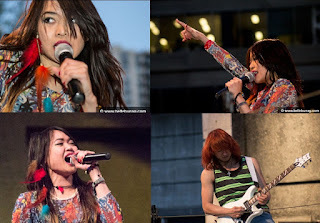 J'Nai, live at Art Fusion! Art Fusion actually kind of reminds me of your favorite radio station, Jamsterdam Radio in the sense that it promotes the opportunity for artists to showcase and gain exposure for their talents, while being exposed to and get inspired by other talented artists of various genres. On that note, if you or someone you know has original music and would like to gain worldwide exposure online, at no cost, send your mp3s to jamsterdamradio@gmail.com! We're always stoked to receive new music to add to the rotation! Art Fusion is a great event to attend if you appreciate the arts. It gives artists the opportunity to display their craft, while being among other talented artists- fusing their arts together in one amazing festival! 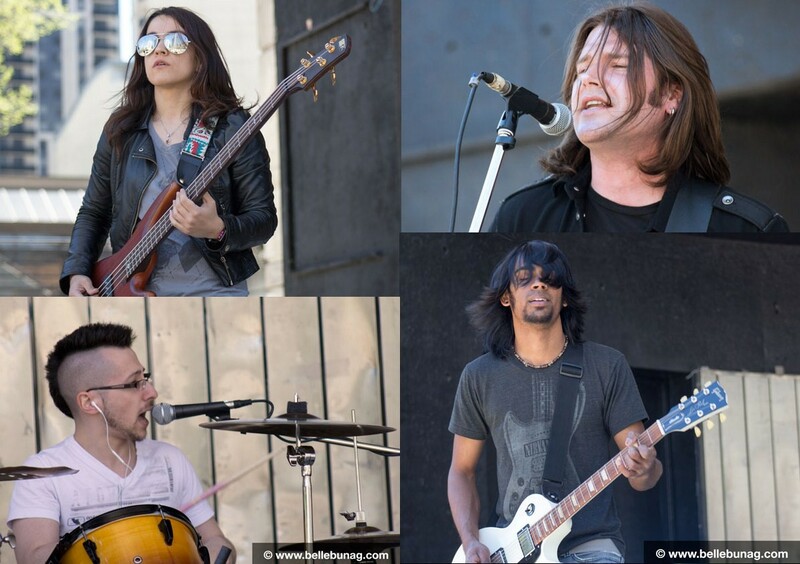 If you're in a band, or you're interested in showing off any other artistic talents you may have, I do suggest you contact Lisa Chessari and sign up for the next one, for it's a great event to network, be inspired and gain exposure! TROVE rocked 3 amazing sets at Mel Lastman Square! If I were to sum up this experience at Art Fusion in a few random words, I'd describe it as: magical, colorful, high-energy, compelling and, of course, a literal marriage of the arts. I always feel so lucky I every time I get the Art Fusion experience, to be around so much awesome- all in one venue. It looks like the next Art Fusion event will be a Carnival held on October 19th, taking the streets of Toronto! See you there!